↑ ସେହେଗାଲ, ସୁନିଳ (1999). ହିନ୍ଦୁଧର୍ମର ଭାଷାକୋଷ: (H - Q). Sarup & Sons. p. 868. ISBN 8176250643. ↑ Pradhan, Ashok (11 September 2015). "IIT Bhubaneswar becomes first IIT in country to introduce dance as BTech subject". Times of India. Retrieved 13 September 2015. ↑ Barik, Satyasundar (12 September 2015). 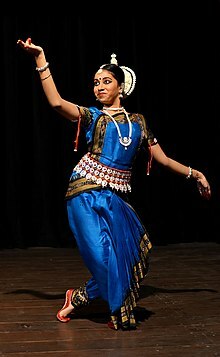 "IIT-Bhubaneswar to train students in Odissi too". The Hindu. Retrieved 13 September 2015. ↑ "IIT-Bhubaneswar Becomes First IIT to Introduce Odissi as a Course". New Indian Express. 12 September 2015. Retrieved 13 September 2015.